In only his second CotM to date, Daniel Konn-Vetterlein brings us fully up to date with the Red finned Chaetostoma which, as it turns out, it something of a red herring too. It is the most beautiful species of the genus, but unfortunately also one that is rarely seen on lists: C. aff. lineopunctatum L276. The original specimen for the DATZ publication was collected in the Río San Alejandro, a Peruvian clearwater stream, flowing into Río Aguaytia, which discharges into the mighty Río Ucayali. In contrast to most other species of the genus, L276 does not necessarily need low water temperatures, because they rise to 30°C in their natural biotope. I kept mine at 28°C and they did perfectly fine. Otherwise they are similar in behaviour and needs. Fresh vegetables, algae and oxygen rich water with a lot of movement are the best conditions to guarantee a successful time with those highly interesting fishes. The silvery-grey body is littered with dark spots, arranged in three to four lines. The fins don't show any pattern. In stress colouration the dark spots on the caudal peduncle tend to disappear totally. The attractive red colouration differs from specimen to specimen, most photographed individuals show at least some red in the caudal and dorsal fin. In some of them there is even more red visible, connecting both mentioned fins alongside the caudal peduncle. On the other side most individuals only show a faint red colouration in the caudal and dorsal fin. Sexual dichromatism can now be excluded as an explanation, the genders show the same differences as we know from other Chaetostoma: Males have a broad head, are slenderer than females and have enlarged pectoral fins, including a thick pectoral spine. Spawnings of L276 have not been reported yet, but I assume reproduction is like others of which we already know about from this genus. 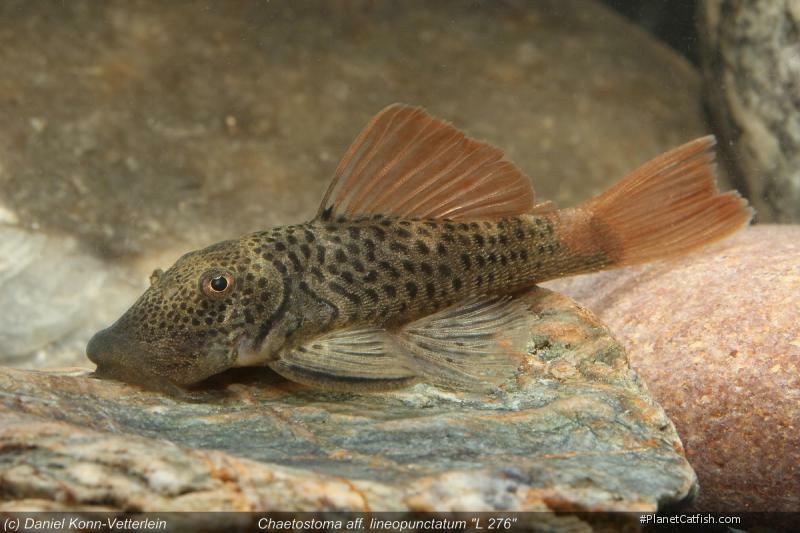 Unfortunately, Chaetostoma do not belong to the popular plecos people try to breed regularly, but now and then reports are being made that eggs or juveniles have been found in stone crevices or in between of big pebbles. The type locality of C. lineopunctatum, the Río Azupizú does not have its source in the Cordillera Azul like the Aguaytia and the San Alejandro. Its located far more in the south, in the sanctuary of San Matías-San Carlos and flows in north-eastern direction towards the Río Ucayali, discharging into Río Pichis near the town of Puerto Bermudéz which later unites with Río Palcazu to form one of the major tributaries of Ucayali: Río Pachitea. The mouth of Río Pachitea into Río Ucayali is located roughly 100 km south of the confluence of Aguaytía and Ucayali, latter being northwards of the town of Pucallpa. There is no connection between both rivers upstream anywhere. Furthermore, the type locality is a clear-water river, while Río Ucayali is considered a white-water river, likely forming a natural barrier between Río Aguaytía and Río Azupizú, latter being far off anyway. Considering the obvious differences in the phenotype of L276 and C. lineopunctatum, as well as the extensive distance between the species' type locality and the location where L276 used to be collected, I am sure we are not dealing with the same species. During the last years we have learned a lot about the growing diversity in the genus Chaetostoma and many new phenotypes showed up the first time. Especially the range from Venezuela to the south of Peru, eastwards of the Andes is very rich in Chaetostoma spp. Therefore, it is very likely that we used to put the wrong scientific name on a scientifically not yet described l-number. In 2017 I got a group of unidentified Chaetostoma from my friend Patrick Gleißner, which he imported from Peru, and for a short while I thought this could be the true C. lineopunctatum. They matched the drawing of the holotype pretty well, but we were not able to get a more detailed location for them as "Peru". Their body was more elongated than it is in L276, the fins were spotted and only the upper caudal ray was coloured reddish. But there was also a black blotch between the dorsal spine and the first soft ray, a distinctive characteristic not shown or mentioned in the species description. The description states the following: "a series of spots between the dorsal spine and the first ray", a trait my individuals did not show. They didn't belong to any described species, neither to a l-number, but represent another new species in the hobby. There are more species, also described ones with a red seam in the caudal fin, for example L 348 from the Río Huallaga (Peru). L 348 is even more elongated than C. lineopunctatum, the spotting is not as fine, and the last dorsal soft ray does not reach the adipose fin as it is the case in C. lineopunctatum. I don't think it's impossible that the true C. lineopunctatum has not shown up somewhere in the trade during the last years, if so, it was likely not detected as what it was, but I am sure that the taxon cannot be assigned to any l-number, neither to a fish we know from trade now. It's known distribution is restricted to the Río Azupizú, a less known and not frequently fished river. Eigenmann, C. H. and W. R. Allen, 1942: Fishes of Western South America. I. The intercordilleran and Amazonian lowlands of Peru. II.- The high pampas of Peru, Bolivia, and northern Chile. With a revision of the Peruvian Gymnotidae, and of the genus Orestias. University of Kentucky. i-xv + 1-494, Pls. 1-22. Copyright information for the images used in this article can be found on the species' full Cat-eLog page. Etymology Greek, chaite = hair + Greek, stoma = mouth. Size 120mm or 4.7" SL. Find near, nearer or same sized spp. Identification The genus Chaetostoma is not straightforward to identify, but as a general rule, the species has spines behind the gill-cover (interopercular odontodes), no plates on the abdomen, and aside from C. platyrhynchus also lack plates on the snout edge. Different from Ancistrus by not having fleshy tentacles on the snout. Distribution The L number specifically was collected in the Rio San Alejandro. Log in to view species occurence data on a map. Breeding Reports There is no breeding report. Registered Keepers Keeping this species? Why not . There are 5 registered keepers, view all "my cats" data. Wishlists Love this species? Click the heart to add it to your wish list. There are 3 wishes to keep this species, see who wants what. Spotters Spotted this species somewhere? Click the binoculars! There are 6 records of this fish being seen, view them all. Get or print a QR code for this species profile, or try our LFS label creator. Back to Catfish of the Month index.